Since 1984 BobCAD-CAM has assisted thousands of US manufacturing businesses to strengthen their ability to remain competitive in their markets. In keeping true to tradition BobCAD-CAM decided to launch the latest Participation Grant as a great new solution for North American manufacturers to use in order to stay strong and competitive in what they do. BobCAD-CAM Participation Grants provide up to 50% of costs on projects geared at improving the companies competitiveness, in return enabling them to make improvements faster and more aggressively than they could on their own. This grant program offers an effective tool to assist local companies adversely affected by foreign trade. 28200 US Hwy 19 N.
We are not consultants and we have nothing to sell you on the program. The grant program in conjunction with MATAAC (MidAtlantic Trade Adjustment Assistance Center) will simply match your payments to outside, third party experts so that you can improve your competitiveness right now. TAAF (Trade Adjustment Assistance for Firms) partners with a company by offering 50/50 cost sharing of projects aimed at improving the firms competitiveness. Specifically, the funds are applied toward the fees of consultants, engineers or other outside professional service providers. If you need a partner with the power to assist in your competitive turn around, please contact us today! There is absolutely NO cost to apply for this new program. All you need to do is apply! 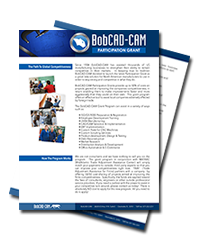 The BobCAD-CAM Participation Grant opens new business opportunities for unique organizations and associations as well. Provides tangible resources that can help stabilize and increase local jobs. Assists small businesses in virtually any industry. Helps retain your regions local small business base. Generates a new and ongoing source of referrals and introductions to potential clients. Spans a wide breadth of industries, meaning most consultants can directly benefit through participation in the grant program. Provides real benefits to companies who may now receive financial and expert assistance that might otherwise have been unattainable. Provides real benefits to help retain and attract new members. Enhances and reinforces your associations differentiation as an excellent resource provider. Provides bottom line, dollar matching, tangible assistance to qualified members. A network of eleven non-profit organizations manages this federally-sponsored program. These Trade Adjustment Assistance Centers (TAACs) are staffed with business professionals who guide you through each phase from application to project completion. To enter the program we must show a negative impact on company revenues and labor and that imports have figured importantly in those events.